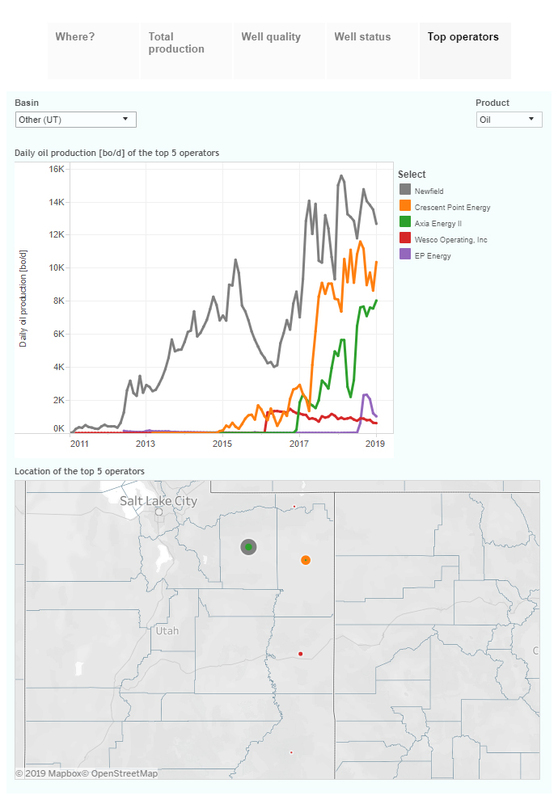 These interactive presentations contain the latest oil & gas production data from all 424 horizontal wells in Utah that started production since 2008, through January. We’ve just included Utah in our coverage of horizontal drilling in the U.S., bringing the total number of covered states to 12. These 12 states are responsible for 99% of recent horizontal drilling activity based on the Baker Hughes horizontal rig count. 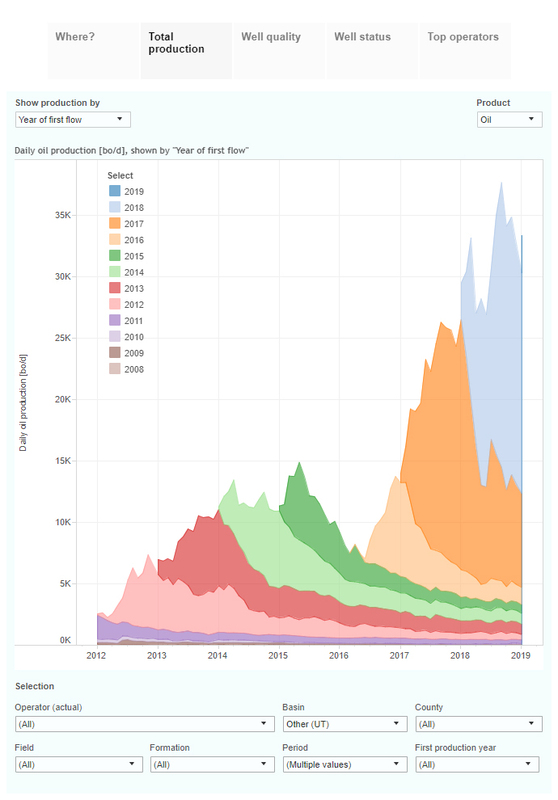 Although the absolute amount of oil & gas produced in this state is relatively is low, compared with the other basins you’ve read about here, the growth rate has been pretty high in the past 2 years. Oil production from horizontal wells was 33 thousand bo/d in January this year, while it was only 14 thousand bo/d 2 years earlier. Activity during this period has been concentrated in Duchesne and Uintah County, heart of the Uinta Basin. 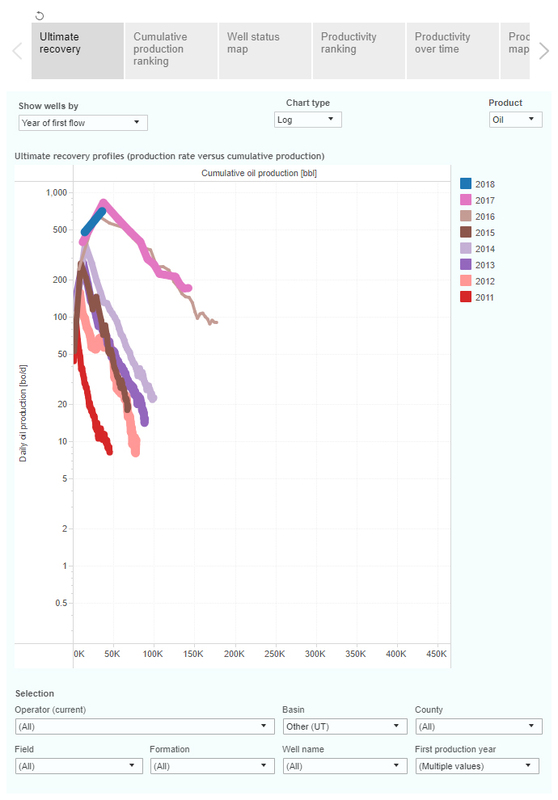 This growth coincided with a major increase in well productivity, as you’ll see in the ‘Well quality’ overview. 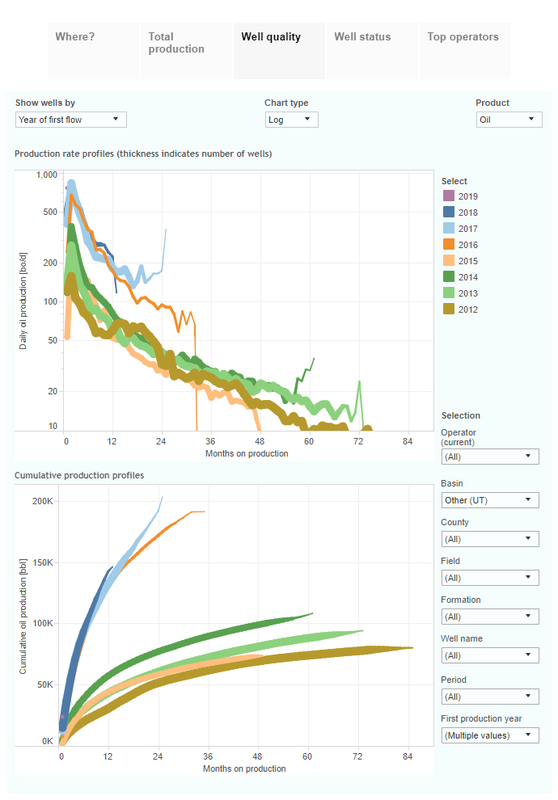 New wells recover on average 130 thousand barrels of oil in the first year on production, more than double the amount from wells that began production before 2016. The final tab shows the top operators in this state. Newfield, the leading operator, has just been acquired by Calgary-based Encana. It has always been the most active player here. The number 2, Crescent Point Energy, showed a big increase in production in 2017. It also has its HQ in Calgary. Also here the major increase in well productivity since 2016 is visible. Newer wells are on a path to recover about 300 thousand barrels of oil before hitting a level of 10 bo/d. Of course there are also major differences here between the operators. 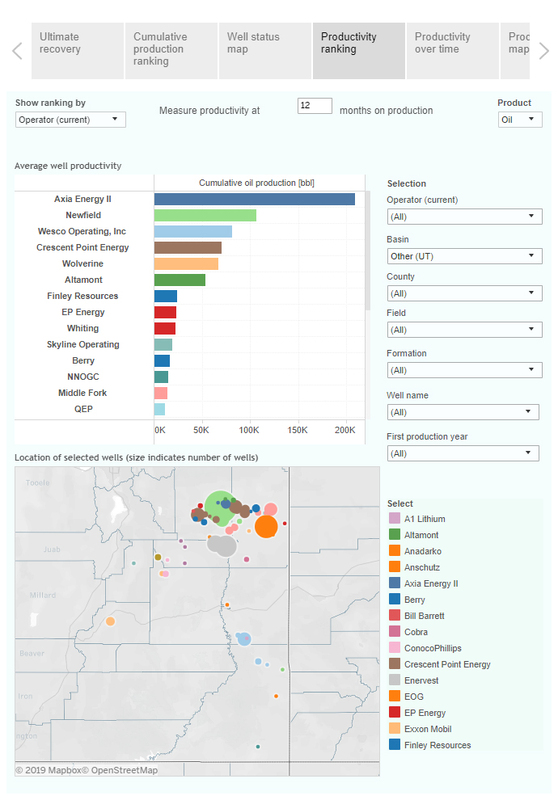 If you only select Axia Energy, using the “Operator” selection, you’ll find that its wells are far above average. It therefore clearly ranks as the best performing operator (see the 4th tab, ‘Productivity ranking’), as measured for example by the average amount of oil recovered in the first year. But the best 2 wells so far are operated by Wesco Operating, as you’ll find in the 2nd tab (‘Cumulative production ranking’). They recovered each close to 1 million barrels of oil so far. We will from now on include Utah in the monthly US post. Next week we plan to have updates on the Permian and the Eagle Ford.